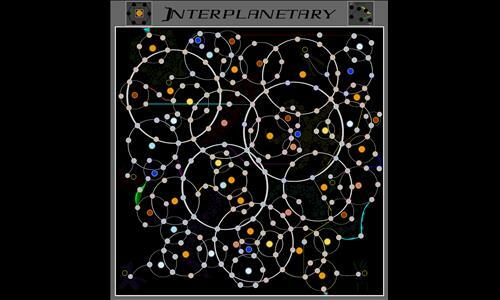 A simple map designed to look like space. Great concept! This is really well laid out. My only difficulty with this map is that it is so visually cluttered that it's hard to keep track of everything. Several of the straight-line shortcuts are disjointed and should be contiguous, e.g., the two different lines linking Pulsar Beam to Desidia and Pulsar, respectively. Also, the link between Asos Junction and Asos Speedway looks sloppy and appears to have been almost an afterthought. Finally, I recommend making each of the bonus value indicators a shape other than a circle. As it is, they look way too much like territories and can quite easily be confused for them. That being said, this is not only a technically solid map, the it is a funny one, as well. And just as an aside to the author, I do read the territory names. Yes, the territory names were submitted by other mapmakers in a forum thread- originally most were just rude words which I had to disguise. The bonuses are meant to look like stars but I can understand why it would be confusing especially if your coulour is similar to the bonus's- I might change it but changing the shape of all the circles around the bonuses will take some time. The shortcut links can easily be fixed. Review by Mudderducker on 5/12/2015. Good map! I like it. Its a clever design making for an interesting game. I think the bubble artwork in the background could be slightly lighter, they are almost to dark to see. Review by Andalorium on 1/12/2017. but still a great map. A fun and different approach to maps. Enjoyable.